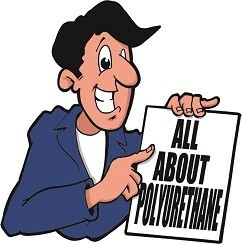 This month we picked on Polyurethane to have a delve or closer look at, at this end we tend to find its name often abbreviated to ‘urethane’ or even PU for it’s really short name, it’s also not surprising that it’s got a few trade names as well just to muddy the waters even more, but hopefully we’ll be able to cut through all this jargon and help explain simply what this material is all about. So what is it exactly (or even roughly)? If we were to describe 90 shore polyurethane (we’ll go into ‘shore’ in detail a bit later) we’d say it was like a hard rubber or maybe a soft plastic, it’s flexible and you can dig your nail into it but it won’t leave a mark. Because it has these ‘rubbery’ properties, it’s often sought after by people who want or need to keep the flexibility of rubber but without any of the downsides, that’s why we say it’s like rubber on steroids. From an engineering point of view, you’re going to find it on some of the better pallet truck wheels and also fork-truck wheels, roller coaster wheels, soft hammer heads etc as well (here’s the big one) as high performance car suspension components and engine/transmission mounts etc, which is something it’s really famous for. I have also seen PU tubes used in place of springs on press tools. Other applications for sheet would be hopper and chute lining, shot blast screening, wear strips on snow ploughs and rally car mud flaps. From a none engineering point of view it actually seems golf balls and even bowling balls are made from polyurethane, although they seem miles apart in terms of hardness, this is where we meet that word ‘shore’ again. What’s it got that rubber hasn’t? Well wear resistance is absolutely superb for polyurethane, and on a whole different level altogether to that of rubber, PU really does have exceptional resistance to wear, it doesn’t end up on the bottom of snow-plough scraper blades for nothing. PU will also resist permanent deformation if kept under a heavy load and so will much more likely to return back to its original shape to carry on doing its job (critical for competition car suspension parts) it’s also very tolerant of oils, grease and chemicals which is quite handy as well. Another ace up its sleeve is that it tends not to degrade through UV or weathering unlike rubber, which means it will last literally years without any deterioration. Now not that I’m an expert here but I reckon it’ll be much easier to machine, not that PU is easy by a long stretch but rubber must be on whole different level. You’re also able to get a specific hardness to suit your application which is great, from really soft to really hard and actually just about anything in between. Colours are also pretty easily available if that’s important, red is our standard colour but if you wanted to use a house colour or want to colour code something, that’s not so difficult. There’s also a food safe grade/version available to special order if you’re looking for an application that comes into close contact with food production. Shock absorption, it may be obvious but Polyurethane is great at reducing or helping to isolate items or parts from unwanted shock and vibration, much better than other plastics but also without the drawbacks of other traditional materials that’s been used in the past. For rod material, the majority is cast into moulds, so what they’ll have is a steel hot plate or a heated steel work table (great for winter) stand an aluminium tube or tubes vertically with the bases capped and sealed off and the liquid is literally poured into the top of the tube, there’s also usually some silicone release agent spray applied inside to help the material release better once its solidified. Sheet is made by a similar method by creating a sealed mould on the top of this heated steel work table and then pouring the material into the open mould. For thinner sheet, it is often spun by a large machine inside a centrifugal drum which allows the polyurethane sheet to form around the inside of the drum as its spun, to create sheet that is much more accurate in thickness. What’s this ‘shore hardness’ thing all about then?